A Mac mini is a good way to dip your toes into the Mac universe if you’re considering abandoning the familiar terrain of the Windows world. In the U.S., the entry-level Mac mini computer costs between $569-$599 (depending on where you buy) and comes with 500GB of storage, 4GB of Memory and an SD card reader. You can buy the Mac Mini at the Apple Store or Best Buy (cheaper here). Although a sleek device, the Mac mini is a bare bones computer that does not come with basics like a keyboard, mouse, monitor or DVD drive. So be prepared to plunk down more money on top of what you paid for the computer. But the Mac mini does have the advantages of built-in wireless networking and Bluetooth. * Monitor – If you’re using a Windows PC, then you already have a monitor. You can use the same monitor with the Mac mini. Otherwise, be prepared to fork out about $90 for a new 20-inch monitor. So at the minimum, your Mac mini will set you back by $740 (assuming you already have a monitor). Since there are few viruses or malware for the Mac, you can skip on the anti-virus and Internet Security programs that are a must for any Windows PC (there’s a savings of $20 a year). The absence of a disc drive in the Mac mini might give pause those new to the Mac world, but not to worry. 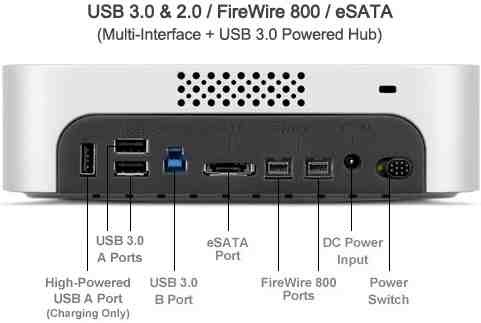 I recommend the MiniStack Max, a 4-in-1 device that includes an external hard drive (good for backing up the Mac mini), optical drive, SD card reader and USB hub with USB 3.0 & 2.0, FireWire 800 and eSATA ports. For $230, you can get a MiniStack Max with a DVD/CD writer, 500GB storage, SD card reader and USB hub. If you’re willing to pay more, you can get a Blu-ray drive and extra storage. The MiniStack Max (see below) is built to sit neatly atop your Mac mini. Mac users have the advantage and convenience of the Mac App Store, where there are several thousand applications, both free and priced, in a plethora of categories. I defected from my Windows ghetto to the Mac world nearly two years back. Forget any regrets! It’s been utter joy these last 21-months!